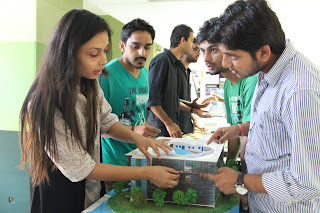 Jalandhar: Lovely Professional University’s School of Architecture & Design organized three-day Zonal Jury for National Awards towards Excellence in Architecture Thesis Programme- 2012. This event was held on behalf of the Council of Architecture’s (CoA) academic unit - National Institute of Advanced Studies in Architecture (NIASA). 28 Architectural Institutions of the Zone participated. Around 3000 students, faculty members and invited elite ones witnessed the final jury round held at the SBRM Auditorium of the university. The awards at the finals, ‘NATIONAL FINAL JURY’ will be held in Cuttack (Orissa) on 6th October, 2012. The entries presented at the Zonal and National Juries will be published by Council of Architecture. The aim of the Awards is to promote architectural and design fraternity. This is an annual event conducted to identify the best thesis projects of India. There are two stages of the programme, first stage had Exhibition and Short-listing. Members of the zonal jury inspected and shortlisted ten thesis projects from amongst all the entries received from 28 Architectural Institutions of the Zone. In the next step, designers of these ten shortlisted thesis projects made audio-visual presentations. Of these ten, all the three participating LPU students, Nahid Khanam, Prithvi Singh & Ishan Juneja were selected for award of Rs 5000 each+ Books. They were also awarded certificates of Participation and Merit. UID one of the top design and innovation schools in the world, offering both an MBA in Sustainable Business and Certificates in Sustainable Business and Entrepreneurship & Intrapreneurship. By following this site thesis writing service you'll be able to get more info for your work and thesis.